The Honor Play is an upcoming smartphone from the Huawei-owned brand, and is scheduled to launch in India on August 6. So far in 2018, we have already seen Honor's flagship Honor 10 (Review), the budget Honor 7A and Honor 7C (Review), the mid-range Honor 9N (Review), and others in the pipeline such as the Honor Note 10 which was just launched in China. The Honor Play is the first smartphone in India to come with Huawei's GPU Turbo technology out-of-the-box; it will be rolled out to other Honor smartphones via OTA updates. Other highlights of the Honor Play include AI camera enhancements, a metallic back, up to 6GB of RAM, and the trusty HiSilicon Kirin 970 processor. 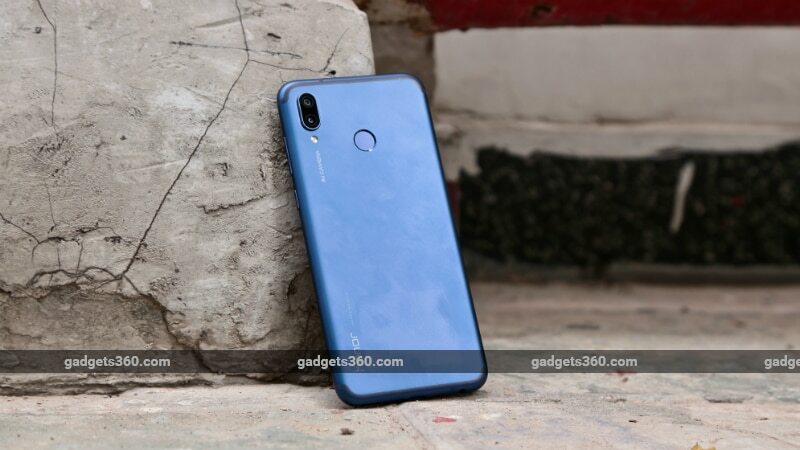 While the price of the Honor Play in India hasn't yet been revealed, a company spokesperson told Gadgets 360 that it will be in line with the device's China pricing, which is CNY 1,999 (approximately Rs. 20,100) for the 4GB RAM variant and CNY 2,399 (roughly Rs. 24,100) for the 6GB RAM variant. Both have 64GB of UFS 2.1 storage, and both are coming to the Indian market. This kind of pricing could put the Honor Play in direct competition with the Xiaomi Mi A2, which is coming to India next week, potentially with a similar pricing strategy. Apart from the Mi A2, we can expect the Honor Play to compete with the likes of the Nokia 7 Plus (Review), Huawei P20 Lite (Review), and Moto X4 (Review). A departure from current premium Honor and Huawei smartphones, the Honor Play has a metallic body and not a glass rear panel. Honor suggests that it is keeping options open for its audience, giving people both a bold glass design and a subtle metallic design to choose from. We found the metallic body to be quite comfortable to hold, but it obviously lacks the shimmer of the company's now-trademark multi-coloured glass designs. The phone will be made available in India in black and blue. The Honor Play sports a 6.3-inch full-HD+ (1080x2340 pixels) IPS LCD display with a 19.5:9 aspect ratio, and can reproduce 85 percent of the NTSC colour gamut. The design isn't borderless, but there is still a substantial notch at the top of the screen. There is also a large chin on the bottom, with Honor branding, but decently thin sides. Courtesy the tall form factor, the Honor Play is easy to hold in one hand. The Home, Back, and Recents navigation keys are on-screen. The notch can be masked by adding black borders on either side. The notch houses the front 16-megapixel camera and the necessary sensors. The rear of the smartphone has a vertically aligned dual rear camera setup with 'AI Camera' branding. Thre's a 16-megapixel primary sensor with an f/2.2 aperture lens, and a 2-megapixel secondary camera with an f/2.4 aperture. The native camera app has a toggle for AI mode, which seemed to over-sharpen images taken in bright sunlight or with good indoor lighting. We have not yet tested the Honor Play's low-light and macro capabilities, and you will have to wait till our review for our full judgement of this phone's cameras. In the limited time that we spent with the Honor Play, we found the fingerprint sensor on the back to be placed a bit too high for our comfort. But in terms of performance, we found it to be quick and accurate. On the right are the usual volume controls and lock/ power button. The phone has a hybrid dual-SIM tray on the left, which can fit two Nano-SIMs or one Nano-SIM and one microSD card. The Honor Play has a USB Type-C port on the bottom, alongside a 3.5mm headphone jack, the primary microphone, and the speaker grille. Lastly, the secondary microphone can be found on the top. The Honor Play has a 3,750mAh battery, and comes with a 9V/ 2A (18W) charging adaptor. It does not support Huawei's SuperCharge 22.5W battery technology. Battery life will also be tested extensively in our full review, coming up soon. Much like other Huawei and Honor smartphones in India, the Honor Play runs EMUI 8.2 atop Android 8.1 Oreo. This heavily customised Android skin has a lot of bloat including preloaded games such as Asphalt Nitro, Kingdoms, Dragon Mania, Puzzle Pets, Sonic Runners, and more. It also has a couple of other apps such as Netflix and Facebook. Honor is highlighting its GPU Turbo technology as the marquee feature of the Honor Play, and in fact this phone was initially launched in China as a gaming-focused smartphone. The company claims 60 percent better performance and 30 percent improved battery life when playing games with GPU Turbo, and we will test this extensively as well. In our brief time gaming on the Honor Play, there appeared to be no stutter, and Asphalt Nitro played well. In the future, parent brand Huawei is looking to use GPU Turbo for UI elements of its phones, a spokesperson confirmed to us. product Honor Play India launch date is August 6. Here are our first impressions of the smartphone.